Emerald Hills is a 55+ community in Bel Air, Maryland. This active adult neighborhood provides homeowners with a quiet and intimate setting where they can mingle with other like-minded individuals. Emerald Hills consists of three and four-story condo buildings with elevator access and secure entrances. Residents enjoy charming amenities found at the community's clubhouse where they gather with neighbors and friends. Located in Harford County, MD, residents living in Emerald Hills are close to everyday conveniences and attractions. Major roads, parks, golf courses, and shopping are all just a few minutes away as well. The central gathering point in Emerald Hills is the charming clubhouse that's just across the street. Here, residents mingle with friends in either the multi-purpose or meeting room. They can maintain a healthy lifestyle by working out in the exercise room. Homeowners can prepare a snack for an event by using the catering kitchen. Outdoors, residents can take a dip in the pool or soak in the spa during the warmer months of the year. Hosting a party in the picnic pavilion is another convenience of living in Emerald Hills. The beautiful natural park space and walking trails are perfect for leisurely strolls in the neighborhood. The playground is a fun area for when the grandkids come to visit. Construction of Emerald Hills began in 2005 by Victor Posner Communities and was completed by 2015. This active adult neighborhood consists of approximately 240 condo units. Residents enjoy living in low-maintenance and secure condos with elevator access. Association fees include exterior home and common areas maintenance, snow removal, and landscaping. Homebuyers can choose from seven distinct floor plans in Emerald Hills. These condos range in size from 871 to 1,449 square feet. They have one or two bedrooms, one or two bathrooms, and parking lot spaces. Some units typically have hardwood floors, nine-foot ceilings, crown molding, a large kitchen, breakfast nook, screened porch, and storage shed. Residents can be as active and social as they want to be in Emerald Hills. They can gather with friends in the clubhouse, host a holiday party, or attend a community event. The picnic area and pool are perfect spaces for entertaining guests and family during the summer months for barbecues and pool parties. Homeowners have more time pursuing hobbies or starting a club with other residents based on similar interests. 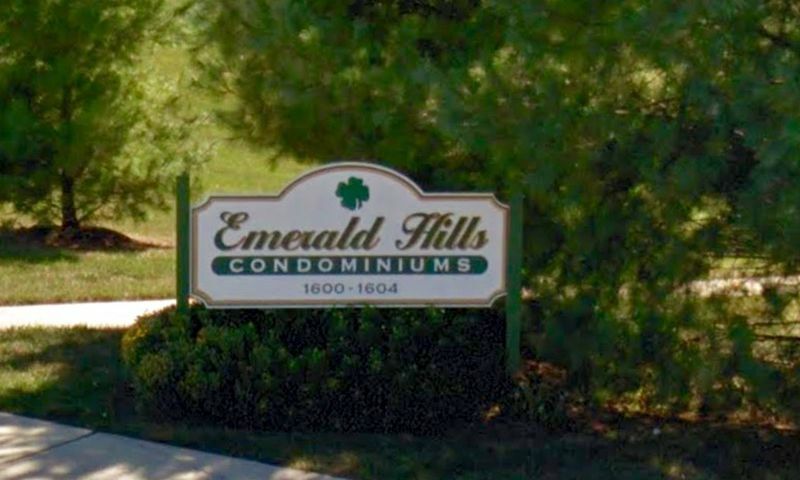 Emerald Hills is located in Bel Air, Maryland. Easy access to Interstate 95 makes driving around town a breeze. The community is close to a Safeway, CVS, and Starbucks. Downtown Bel Air is nearby with plenty of restaurants and other daily necessities. Residents can shop at Bel Air Plaza Shopping Center, McPhail Crossing Shopping Center, Tollgate Mall Shopping Center, and Harford Mall. Several parks are nearby as well for outdoor recreation. Golfers can check out Maryland Golf & Country Club or Winters Run Golf Course. For big-city entertainment, residents can drive about an hour or more to Baltimore, Annapolis, or Washington D.C. The Baltimore/Washington International Airport is 50 minutes away for long distance travel. Homeowners living in Emerald Hills will enjoy its maintenance-free condos and serene setting in Harford County, Maryland. There are plenty of activities available in Emerald Hills. Here is a sample of some of the clubs, activities and classes offered here. Homebuyers can choose from seven distinct floor plans in Emerald Hills. These condos range in size from 871 to 1,449 square feet. They have one or two bedrooms, one or two bathrooms, and parking lot spaces. Condo units have hardwood floors, nine-foot ceilings, crown molding, large kitchens, breakfast nooks, screened porches, and storage shed. 55places.com is not affiliated with the developer(s) or homeowners association of Emerald Hills. The information you submit is distributed to a 55places.com Partner Agent, who is a licensed real estate agent. The information regarding Emerald Hills has not been verified or approved by the developer or homeowners association. Please verify all information prior to purchasing. 55places.com is not responsible for any errors regarding the information displayed on this website.